As classic car drivers, we should be thankful that the major tyre manufacturers are still proud of their heritage and understand the value of fitting period tyres to our vehicles. After all, there isn't that much call these days for a 185VR15 Michelin XVS or a 640H15 Dunlop! The fitting of period tyres to classic cars not only enhances their looks but more importantly to us as drivers, enhances the way they feel and communicate with the road. Without power steering, these earlier cars benefit from the light, precise steering provided by thinner tyres. Fitting the wider variety will only detract from the feeling you get through your steering set-up that was not designed to work with such tyres. In fact the only reason to fit wider tyres is the availability of a cheap option. 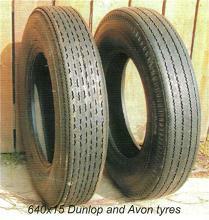 640H15 Dunlop RS5: SI E-types were fitted with this tyre as original equipment and the 11/2 offered it as an option. If it is crossply you want, I can see no reason to fit any other tyre. Crossplies have a tendency to wander slightly at cruising speeds and squeel dramatically on corners. Good fun really! Unfortunately this Dunlop RS5 tyre is no longer produced. 640S15 Avon Super Safety is a good tyre. Original Rover P4 fitment with a H (130mph) speed rating, which is not quite enough for an E-type. 185HR15 Dunlop SP Sport: This is the tyre which shod most new E-types and is also known as the Aquajet. It is a really super looking period cover and first choice for the drivers who have originality high on their lists of priorities. 185VR15 Michelin XVS: Probably the best handling tyre available in this size. In 1965 Michelin developed the XAS, the first asymetric tread pattern and carcass, which worked together to enhance the handling of the cars of the period. The XVS is a development of the XAS and is available in a V-rating (150mph). The XVS-P is the same tyre with a raised curbing band on the outside, this is H-rated (130mph). You will notice a marked improvement in your steering feel with these tyres. 185HR15 Vredestein Sprint Classic: Modern tyre with a modern style tread pattern. 185TR15 Hankook: Modern tyre low speed rating. Not suitable in my opinion. 185SR15 Michelin X: The first radial tyre designed in 1946. Very attractive from a period looks point of view, it has rounded side walls like a crossply. But the speed rating is not up to the performance of an E-type. 185VR15 Avon Turbosteel: Another good option. A good quality British period tyre with a V (150mph) speed rating. This car with its V12 engine and heavier front end was equipped with power steering as standard. It allowed Jaguar to fit a larger tyre without having to worry about making the steering heavy and unmanageable at low speeds. (It is a mistake to fit these fatter less communicative tyres to an earlier car without such assistance). ER/70HR15 Dunlop SP Sport (Aquajet): Original equipment. One of the best options for the car. 205/70VR15 Michelin XWX: Superb tyre, fitted to all the European supercars of the day. This tyre had the highest speed rating available in period. The XWX is also renowned for its longevity. 205/70VR15 Avon CR6ZZ: Road/race tyre with an attractive period tread pattern. A really good option for sporty use. Perfect if you are attending track days. 205/70VR15 Vredestein: Expensive, modern tread pattern. 205/70ZR15 PIRELLI R4000: Modern tread pattern and the tyre's shape is also modern in that it has a wide footprint and square shoulders. Not a tyre I would recommend for an E-type but they are cheap. No longer made. 205/70TR15 Supreme 3/4" white wall: Too low a speed rating. 205/70HR15Enduro 3/4" white wall: I am not personally a fan of white wall tyres on good British sports cars. I think that they should be left to big American cars that only go in straight lines at 55mph. But this tyre does have a 130mph speed rating.